Picking up from a glum report on manufacturing prospects the week before, the Institute for Supply Management said it non-manufacturing index dipped to its lowest point since February 2010. The index, based on purchase manager surveys, indicated the industry still expanded for the 79th consecutive month, but the growth slowed unexpectedly. Employers set a record in July for the most job openings posted – nearly 5.9 million, according to the Bureau of Labor Statistics. The numbers of workers hired as well as those who quit their jobs also increased marginally. Quits signify the confidence of workers to find new jobs. With demand rising for workers, economists expect higher wages to follow, which can lead to the increased consumer spending that drives two-thirds of U.S. economic growth. The moving four-week average of initial unemployment claims fell for the third week in a row and the seventh time in the last 10 weeks. Another sign of employer demand, the persistent lack of jobless applications suggests employers are reluctant to let workers go, which also could eventually lead to wage increases. Based on Labor Department data, jobless claims have been below the 48-year average every week for more than three and a half years. The Federal Reserve reported that credit card debt continued rising in July, although at its slowest pace in five months. 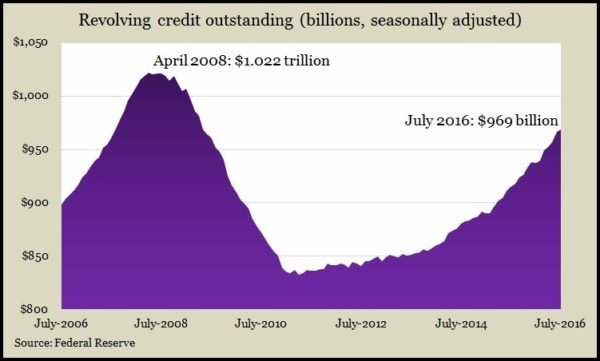 Seen as a sign of consumer confidence, credit card debt rose to its highest level since the Great Recession. Still, total revolving debt – as it’s called – remains more than 5% below its peak set just before the financial crisis eight years ago. A months-long trend in stockpile cutbacks continued in July with a very slight decrease in wholesale inventories, according to the Commerce Department. However, sales at the wholesale level declined for the month, resulting in a larger ratio of inventories to sales. The ratio indicates how leanly businesses are operating, which has been at heights last seen during the 2008 financial crisis.